The 2017 Minke Season was one to remember! After last year’s lower than average numbers, it was a great relief to see so many whales this year. Over the six weeks of dedicated Minke Expeditions, Spoil Sport crew and passengers encountered well over 200 dwarf minke whales and witnessed many incredible behaviours including breaching, spy hopping, pirouetting, and even some very close approaches (within 1 metre!!!). I was lucky enough to go out with the Mike Ball team for their final Minke Expedition with the man himself, Mike Ball. We had several encounters but one in particular stands out to me. It was the 15th July and we had been drifting with 10+ whales for a few hours. The whales were exceptionally curious during this encounter and we were lucky to experience many of the behaviours mentioned above and more! At the end of the encounter, I was pulling myself back to the boat along the snorkel line when I glanced over my shoulder to see a 6 metre whale right behind me. I grabbed one final snap for our photo ID catalogue before continuing back the boat. When I turned back again, the whale was still there… This amazing creature was literally following me back to the boat! The whale then came up next to me (within 1 metre) and swam beside me as I made my way back to the vessel, never breaking eye contact. Mike was the last one out of the water, and I will never forget the look of joy and excitement on his face as he took one last look in the water and shouted “there are five whales sitting underneath me!!! !” It appeared that the whales didn’t want us to leave! The whales stayed with us until we left, spy hopping occasionally to see where their new friends had gone. They even followed the boat briefly before conceding defeat and going off on other important minke business. Clearly they were not ready for the encounter to be over. Everyone on-board was just speechless. There was no words to describe how special that experience was. Nature at its finest. There were smiles from ear to ear and few tears of joy were shed. Personally, I will never forget that swim back to the boat, being escorted by a dwarf minke whale in the blue waters of the Great Barrier Reef. 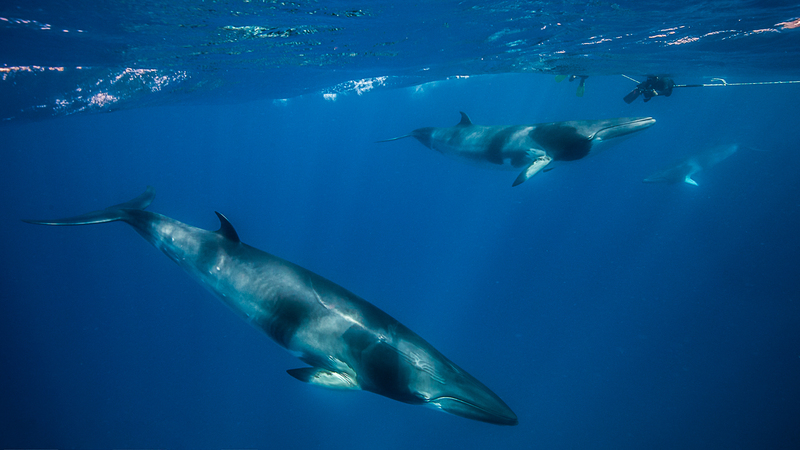 Find out more on future Minke Whale Expeditions.